Azazel is the enigmatic name of a character in Hebrew mythology found in the Hebrew scriptures and Apocrypha. The word's first appearance is in Leviticus 16, where a goat is designated "for Azazel" and outcast in the desert as part of Yom Kippur. He is considered by many to be a supernatural being mentioned in connection with the ritual of the Day of Atonement (Lev. xvi.). Azazel is a theophoric name, combined of the words "Azaz" (rugged) and "El" (power/strong/of God) in reference to the rugged and strong rocks of the deserts in Judea. According to Talmudic interpretation, the term "Azazel" designated a rugged mountain or precipice in the wilderness from which the goat was thrown down, using for it as an alternative the word "Ẓoḳ" () (Yoma vi. 4). An etymology is found to suit this interpretation. "Azazel"() is regarded as a compound of "az" (), strong or rough, and "el" (), mighty, therefore a strong mountain. This derivation is presented by a Baraita, cited Yoma 67b, that Azazel was the strongest of mountains. Another etymology (ib.) connects the word with the mythological "Uza" and "Azael", the fallen angels, to whom a reference is believed to be found in Gen. vi. 2, 4. In accordance with this etymology, the sacrifice of the goat atones for the sin of fornication of which those angels were guilty. Leviticus 16:8-10: "8and Aaron shall cast lots upon the two goats, one lot for the Lord and the other lot for Azazel. 9And Aaron shall present the goat on which the lot fell for the Lord, and offer it as a sin offering; 10but the goat on which the lot fell for Azazel shall be presented alive before the Lord to make atonement over it, that it may be sent away into the wilderness to Azazel." Two goats were procured, similar in respect of appearance, height, cost, and time of selection. Having one of these on his right and the other on his left (Rashi on Yoma 39a), the high priest, who was assisted in this rite by two subordinates, put both his hands into a wooden case, and took out two labels, one inscribed "for Yahweh" and the other "for Azazel." The high priest then laid his hands with the labels upon the two goats and said, "A sin-offering to Yahweh" (thus speaking the Tetragrammaton); and the two men accompanying him replied, "Blessed be the name of His glorious kingdom for ever and ever." He then fastened a scarlet woolen thread to the head of the goat "for Azazel"; and laying his hands upon it again, recited the following confession of sin and prayer for forgiveness: "O Lord, I have acted iniquitously, trespassed, sinned before Thee: I, my household, and the sons of Aaron Thy holy ones. O Lord, forgive the iniquities, transgressions, and sins that I, my household, and Aaron's children, Thy holy people, committed before Thee, as is written in the law of Moses, Thy servant, 'for on this day He will forgive you, to cleanse you from all your sins before the Lord; ye shall be clean.'" This prayer was responded to by the congregation present. A man was selected, preferably a priest, to take the goat to the precipice in the wilderness; and he was accompanied part of the way by the most eminent men of Jerusalem. Ten booths had been constructed at intervals along the road leading from Jerusalem to the steep mountain. At each one of these the man leading the goat was formally offered food and drink, which he, however, refused. When he reached the tenth booth those who accompanied him proceeded no further, but watched the ceremony from a distance. When he came to the precipice he divided the scarlet thread into two parts, one of which he tied to the rock and the other to the goat's horns, and then pushed the goat down (Yoma vi. 1-8). The cliff was so high and rugged that before the goat had traversed half the distance to the plain below, its limbs were utterly shattered. Men were stationed at intervals along the way, and as soon as the goat was thrown down the precipice, they signaled to one another by means of kerchiefs or flags, until the information reached the high priest, whereat he proceeded with the other parts of the ritual. 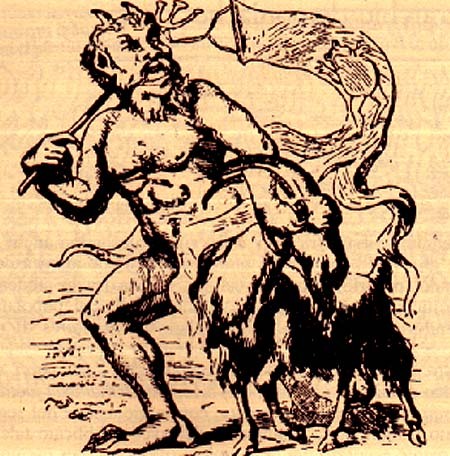 Far from involving the recognition of Azazel as a deity, the sending of the goat was, as stated by Nachmanides, a symbolic expression of the idea that the people's sins and their evil consequences were to be sent back to the spirit of desolation and ruin, the source of all impurity. The very fact that the two goats were presented before God before the one was sacrificed and the other sent into the wilderness, was proof that Azazel was not ranked with God, but regarded simply as the personification of wickedness in contrast with the righteous government of God. The rite, resembling, on the one hand, the sending off of the epha with the woman embodying wickedness in its midst to the land of Shinar in the vision of Zachariah (v. 6-11), and, on the other, the letting loose of the living bird into the open field in the case of the leper healed from the plague (Lev. xiv. 7), was, indeed, viewed by the people of Jerusalem as a means of ridding themselves of the sins of the year. So would the crowd, called Babylonians or Alexandrians, pull the goat's hair to make it hasten forth, carrying the burden of sins away with it (Yoma vi. 4, 66b; "Epistle of Barnabas," vii. ), and the arrival of the shattered animal at the bottom of the valley of the rock of Bet Ḥadudo, twelve miles away from the city, was signalized by the waving of shawls to the people of Jerusalem, who celebrated the event with boisterous hilarity and amid dancing on the hills (Yoma vi. 6, 8; Ta'an. iv. 8). Evidently the figure of Azazel was an object of general fear and awe rather than, as has been conjectured, a foreign product or the invention of a late lawgiver. More as a demon of the desert, it seems to have been closely interwoven with the mountainous region of Jerusalem. According to the Book of Enoch, which brings Azazel into connection with the Biblical story of the fall of the angels, located on Mount Hermon, a gathering-place of demons from of old (Enoch xiii. ; compare Brandt, "Mandäische Theologie," 1889, p. 38). Azazel is represented in the Book of Enoch as one of the leaders of the rebellious Watchers in the time preceding the flood; he taught men the art of warfare, of making swords, knives, shields, and coats of mail, and women the art of deception by ornamenting the body, dyeing the hair, and painting the face and the eyebrows, and also revealed to the people the secrets of witchcraft and corrupted their manners, leading them into wickedness and impurity; until at last he was, at the Lord's command, bound hand and foot by the archangel Raphael and chained to the rough and jagged rocks of [Ha] Duduael (= Beth Ḥadudo), where he is to abide in utter darkness until the great Day of Judgment, when he will be cast into the fire to be consumed forever (Enoch viii. 1, ix. 6, x. 4-6, liv. 5, lxxxviii. 1; see Geiger, "Jüd. Zeit." 1864, pp. 196–204). The story of Azazel as the seducer of men and women was also familiar to the rabbis, as may be learned from Tanna d. b. R. Yishma'el: "The Azazel goat was to atone for the wicked deeds of 'Uzza and 'Azzael, the leaders of the rebellious hosts in the time of Enoch" (Yoma 67b); and still better from Midrash Abkir, end, Yalḳ., Gen. 44, where Azazel is represented as the seducer of women, teaching them the art of beautifying the body by dye and paint (compare "Chronicles of Jerahmeel", trans. by Moses Gaster, xxv. 13). According to Pirḳe R. El. xlvi. (comp. Tos. Meg. 31a), the goat is offered to Azazel as a bribe that he who is identical with Samael or Satan should not by his accusations prevent the atonement of the sins on that day.